Almaguer first decided he wanted to try glassblowing in his early teens. 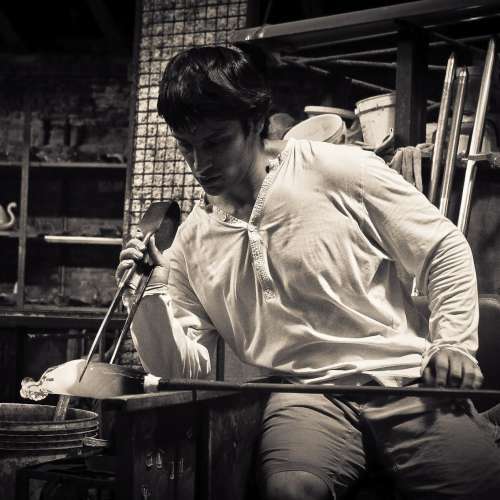 Years later he finally got a chance to try out glassblowing for himself. When he took his first gather of glass he felt like a little kid in a candy store, and has been creating with glass ever since. This fire dancer creates sculptures and blown forms through this substance that is much like lava. Almaguer has received a Bachelor of Fine Art in Glass, won multiple awards for his work, and his work is collected around the world. Almaguer also apprenticed in Murano, Venice, where he lived and worked directly before he arrived in Asheville, NC, where he now makes his work and lives with his wife and kids.